As part of the international day of action against Santander Bank, ISBAN and Panel sistemas, a picket was held in front of a Santander Bank in Wroclaw, in solidarity with the dismissed activist from the CNT union. The members of ZSP Wroclaw blocked the entrance to the bank in the center of the city for a while. A protest letter was handed in to a representative of the bank. The IWA (which the ZSP and CNT belong to) has been organizing an international protest campaign in this bank. 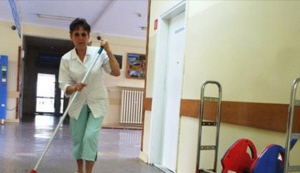 Besides the repression of the union member, there are different problems with the working conditions. For example, many workers are outsourced to a company owned by Santander but, since they are outsourced, they have less job security. They also have lower pay, forced overtime, etc. About 10,000 workers are in this situation. Solidarity actions have taken place in many places around the world, including Spain, France, Portugal, Norway, Great Britian, Germany, Brazil, Argentina, Uruguay, Mexico, Chile and the USA. Protest letters also have come from countries without the presence of these companies, like Slovakia or Russia. 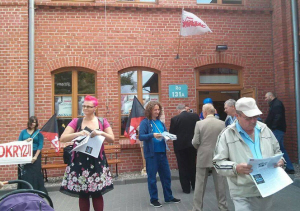 On August 31, activists from ZSP visited events organized in Gdansk by „Solidarity” to commemorate the strike of 1980 and the opening of a new European Solidarity Center on the terrain of the now near-defunct Gdansk shipyards. These events were attended by various union and church leaders as well as the President of Poland, Komorowski. It was a very high-profile event which many people from the public also attended. The reasons to protest at this event were many. „Solidarity” did a lot to betray the workers of Poland. After fighting to „overthrow communism”, as they say, the Solidarity government went on a hardline course to restructure the economy, negatively affecting the next generations of workers. Currently it is acting as a manager of the working class to make sure it does not take any resolute measures against the economic regime which it helped to build. But our main reason to go to this event was to protest the actions of the union in relation to Dino supermarket and to protest this type of business unionism. To briefly describe what happened at Dino, at the end of 2013, some women formed a Solidarity union at the supermarket. 12 of them lost their jobs very quickly – mostly the ones who wrote about improper working conditions on the internet. A local Solidarity bureaucrat negotiated with the supermarket, without the presence of those involved and an agreement was made to take only one person back to work. (She is currently the chair of the tiny Solidarity union.) Then complaints that were filed to the State Labour Inspectorate were withdrawn, negative comments disappeared from the internet page and evidence of violations which were sent to the union disappeared. ZSP has since been fighting to improve things in the supermarket. It has made pickets and has started some legal cases. Thanks to the actions of our M. and the union, Dino is now paying overtime and has made some improvements. Overtime payments from past work was also paid. A group of almost 250 waitstaff, cooks and kitchen help will finally see the money they earned while working at the hotel Double Tree by Hilton in Warsaw. The money was earned a couple of months ago but not paid. After a couple of the workers finally decided to take action, it seems that the conflict could be resolved rather quickly. The first steps was an article in the press and one the ZSP website, followed by a visit to the hotel. Within 2 hours of our visit, we were contacted by the hotel management and a resolution was soon to follow. The staff were hired through the agency AG+, which specializes in catering for events. The hotel, which is run by a company called Polaris, was just opening and, according to its business model, hires outside staff for events, especially conferences and weddings. After one month of work, the hotel did not want to pay, complaining about the services and offering a lower rate of pay for the workers. What followed next was a dispute in which the agency and the hotel were accusing and blaming each other and the workers were just not paid. A few members of the ZSP visited the Double Tree by Hilton hotel today in Warsaw where a large group of workers hired through an agency had not been paid. The union had been planning to take action to help the workers received what was owed to them. We went inside the hotel to hand out leaflets and check out the situation. Less than 2 hours later we were contacted by the manager of the hotel which expressed the desire to regulate the situation and even pay the money owed tomorrow. He asked for our moderation and invited us to the hotel tomorrow to talk and inspect the working conditions. However, we will need a little time to establish how much money is exactly owed and we do not have contact to all the workers. We also need to study the agreements. We are hoping that some of the workers will be able to get their payments ASAP. 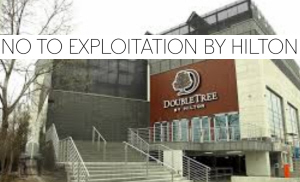 A new Double Tree by Hilton hotel in Warsaw has left over 250 workers without any salary after a month of hard labour, exposing the highly exploitative practices of the international chain. The workers involved were employed through and agency and were forced to work very long hours at the hotel. Typically they were made to work 12-14 hours a day, but some worked even as long as 22 hours – without a break. The cooks and waiters were on civil contracts instead of work contracts. After one month of work, the hotel refused to pay the agency. As often happens in such cases, the hotel complained about the level of service. The workers had worked in different hotels servicing banquets, conferences, etc., without any complaints. The workers had to buy their own clothing for work as Hilton did not provide uniforms. So the workers actually had to lay out money to work like slaves for the hotel giant. 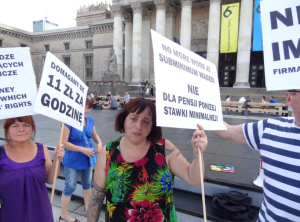 On July 26, ZSP organized an informational action at the Palace of Culture in Warsaw to protest the situation of the workers from Impuls agency and the fact that the city awarded a contract to the firm which is known to notoriously violate workers' rights. At the end of last year, after many protests at that firm, clients, including the city started to terminate contracts with the agency after finding out that they did not pay workers on time or at all. We made a special effort to contact the municipal authorities about the situation as they also worked in municipal offices. But it seems that they are still getting contracts at publically funded institutions and places run by the city. The workers at the Palace of Culture haven't been paid for 4 months already. Impuls is one company that simply needs to be shut down. It has never been a problem of occasional late payments with them. Not paying workers is their modus operandi. They expect most workers not to fight and take the loss. But Impuls workers from ZSP have fought and got at least their back pay. They also are fighting for unpaid benefits. Impuls does not pay people the legal minimum wage because they use trash contracts. This means wages about 1/3 of the minimum wage. ZSP will be campaigning this starting this fall to make working conditions a criteria for awarding public tenders. Currently, the main criteria is price, which means that if some company wants to pay a subminimum wage, they are at an advantage in public tenders. We think that this simply cannot be supported with public money. All the more so because it supports the destruction of stable jobs in favour of paying subminimum wages (or nothing at all). In the last few days, Dino Supermarkets have sent several dismissed employees payments for overtime which they had worked in the past. This is an unusual turn in events. Dino is currently being sued for overtime payments by employees dismissed by the company. After members of ZSP informed the State Labour Inspectorate that Dino was not paying all overtime payments, among other problems, the Inspectorate confirmed these violations and Dino had to start making payments. But this did not concern many old situations where the firm simply did not record the hours worked and it is up to the workers to prove they worked overtime. Many are simply not able to do so but some have taken the chain to court and have a good case against the company. Although the claims are for larger sums that were sent out, the workers are happy to have received something from the company. However the union warns that what is owed is much more and that the unexplained actions of the supermarket may be an attempt to confuse workers and make them believe that the chain will eventually pay all the money, perhaps in attempt to get them to drop their court cases. The union is monitoring the situation and reminds workers from the chain that it can advise about overtime claims and will continue actions throughout the country against unpaid work, unfair dismissals and other problems in Dino.